I found this article to ring true for a lot of us with Celiac Disease or a true medical condition that prevents us from eating gluten. Although going gluten-free has become the latest diet trend, it’s a way of life for people with Celiac disease. Celiac disease has been documented in the medical literature for more than 100 years, but until 10 years ago most doctors knew very little about it, said Nick Rose, nutrition educator for PCC Natural Markets. Gluten, a protein found in wheat, barley and rye, damages the lining of the small intestines in people with Celiac disease, gluten intolerance or allergies. This can cause constipation, severe abdominal pain and nausea. Experts recommend omitting gluten for three primary reasons: treating patients with Celiac disease; helping people with gluten intolerance and allergies; and as a way to rule out possible food intolerances. Those with gluten intolerance will see reduced symptoms of bloating and headaches, but the diet won’t necessarily benefit everyone, Rose said. Health concerns, specific symptoms and supporting a family member have led to the diet gaining more attention, he said. That attention wasn’t always beneficial, said Amber Wester, co-owner of SmartEats, a Mill Creek specialty store stocked with gluten-free products. Misdiagnoses led to over diagnoses, the media hyped it and then celebrities got involved, leading to gluten-free’s fad status, she said. “It distracts from the people who have health issues,” Wester said. 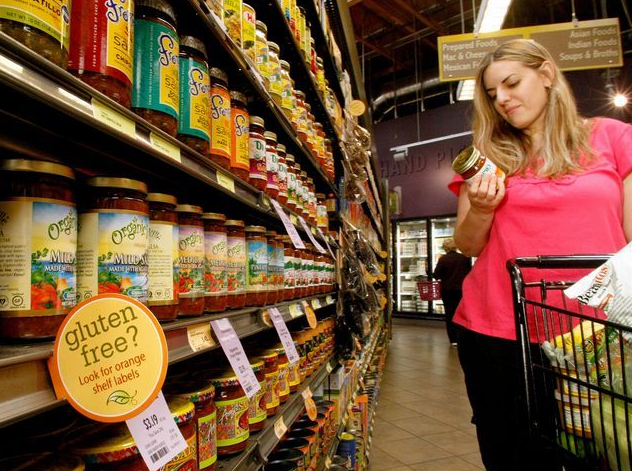 At PCC, gluten-free products are included in an online data base of foods in the store and marks gluten-free products with eye-catching orange tags. Rose recommends people on a gluten-free diet read food labels carefully, as there is no uniform standard used when labeling food as gluten-free. There is also concern about cross-contamination in the oven, toaster and cutting board. “Celiacs pay dearly if they fall off the wagon,” he said. Recipe books are hitting bookstores to help people find tasty alternatives and still consume nutrients. Nutritionist Janine Whiteson was contributing editor to “The Cooking Light Gluten-Free Cookbook,” which hit shelves this month. The book was in response to letters from readers asking for help, Whiteson said. The recipe book offers education about vitamins and nutrient sources and portion sizes and warns about hidden sources of gluten, including bleu cheese, cough syrups and salad dressings. This entry was posted in Culture, Health, News, Science and tagged articles, Celiac Disease, diagnosis, diet, fad diet, gluten-free, GlutenFreePDX, what is celiac? on August 24, 2011 by glutenfreepdx.